Do you live in New Jersey and are dealing with backed up sewer pipes? There are many reasons for this, like missing pipe floors, a root infestation, or your sewer pipes may just be burst or broken. Back in the day, when property owners had to deal with broken or damaged pipes, there was one solution, and it usually involved excavation – a ridiculously expensive, property damaging, and time-consuming process. But, thankfully, this is no longer the case. Property owners in New Jersey can now get their pipes relined. Not only is this process effective, it also happens to be one of the most affordable ways to repair and replace a damaged pipe. Furthermore, it comes highly recommended by experts, especially for those who experience blocked drains virtually every year. Interested in learning more about re-lining pipes and drains without the mess in New Jersey? Keep reading for information. One of the biggest issues of traditional pipe replacement is the process itself. Since most of your pipes are under the ground, to get the job done right, a huge trench must be dug and a large section of your backyard had to be ripped up. This can be incredibly damaging, in terms of your property, and once all the costs associated with the process are tallied, it’s easy to see why this can be incredibly expensive. Pipe relining, on the other hand, is a no mess, no fuss solution that will ensure that nothing happens to your landscape. During this process, an expert will dig two holes on either side of the broken pipe. The experts will then use sophisticated technology to break through the pipe and replace it – without having to dig up your entire yard. We don’t like to take chances unless they are necessary, which is why we believe so strongly in the pipe relining process. 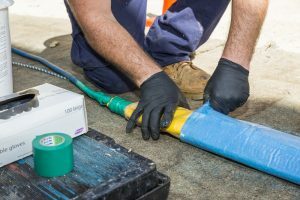 When the joints of your sewer pipes become unsealed or holes or cracks have been formed from roots (or other causes), you don’t have to replace your sewer pipes to repair them it. Oftentimes, pipe relining is the economical solution for both commercial and residential properties. Since this process doesn’t require the removal of your pipes it is less labor-intensive and can save you massive amounts of money. Versatility. You can reline virtually any type of pipe, even the ones with 90-degree angles. Speed. This process takes hours instead of weeks. Cleanliness. Because you won’t have to excavate any pipes or dig up your property, you are guaranteed that any mess will be minimal. One Response to "Re-Lining Pipes and Drains Without the Mess in New Jersey"